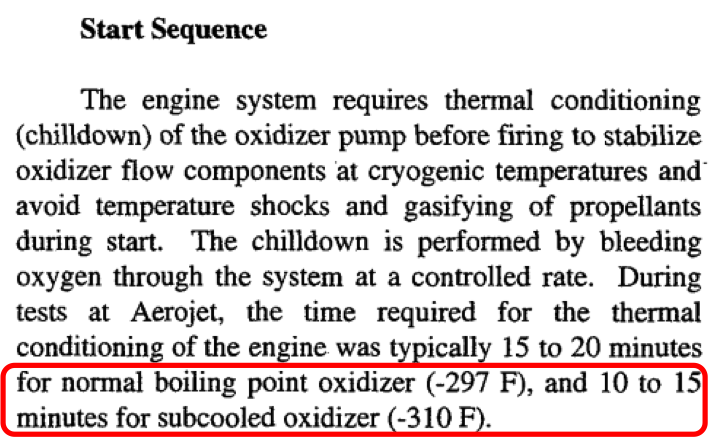 It was mentioned in this answer and in several other places on the internet that the kerosene fuel used by NK-33 engines needed to be subcooled enough so that it reached the same density as the LOX, and that this is required so that the turbopumps can run on the same shaft. These statements all trace back to here, where I can not actually find any discussion of subcooled kerosene, much less a discussion of the need to match the density of LOX. I think it would be extremely hard to obtain liquid kerosene at a density of 1.17 or 1.18 g/cm3, which is the density of LOX at -310 ℉, the temperature that the NK-33 engines require in order to cool the turbopump bearings. The density of RP-1 is about 0.8 g/cm3 at 25 ℃, and the largest value I’ve seen anywhere is 1.02 g/cm3. I can’t think of any reason why the densities should be equal to run the two turbopumps on the same shaft. The ratio of the mass flows is quite large - perhaps 2.62 LOX/kerosene (from here) so I don’t understand why matching their densities in the two pumps so closely is important. note: I use the generic “kerosene” since the Russian fuel used to develop the engines can’t officially be called “RP-1”. I’ve tried to collect as much information as I can on-line, and plot it here. Since I've had to deal with four different temperature scales, and people are accustomed to using different ones, I've just brute-force plotted with all four since I can't do the conversions in my head either. RP-1 solid blue line from http://www.dtic.mil/dtic/tr/fulltext/u2/290659.pdf. Other data points I’ve found seem to match. RP-1 dashed red line is an extrapolation of the same line below it’s valid range of -45 ℃ to +25 ℃, just to guide the eye and give the brain something to thing about. RP-1 comments on consistency (“gel”, “wax”, etc.) are from http://ntrs.nasa.gov/archive/nasa/casi.ntrs.nasa.gov/20020018567.pdf. I have included a screenshot of the relevant section below the plots. LOX solid line from http://booksite.elsevier.com/9780750683661/Appendix_C.pdf. A screen shot of the entry and equation is given below. EDIT: additional LOX data points can be found at Spaceflight 101 and here, credit: NASA. My question is: Does the operation of the NK-33 engine really require equal densities of LOX and kerosene? If so, WHY?? Also if so, what is the actual temperature of the kerosene to acheive this density, and what is its consistency really like, liquid, gel, wax? 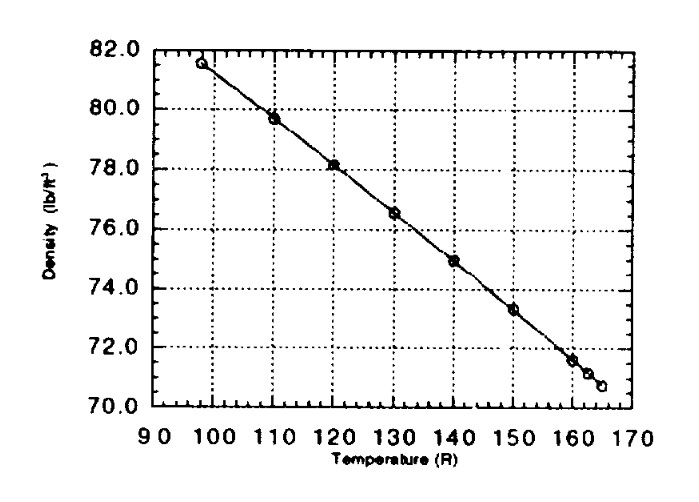 NOTE: below is from: http://ntrs.nasa.gov/archive/nasa/casi.ntrs.nasa.gov/20020018567.pdf R is temperature in Rankine - which could be called "absolute Fahrenheit" I suppose. The NK-33 requires sub-cooled Oxygen with a temperature below its boiling point of -183 degrees Celsius to cool the turbopump bearings that would otherwise fail. Also, sub-cooled LOX has a higher density, close to that of Kerosene, reducing required tank volume and overall launch vehicle mass and allowing the engine to use a single rotating shaft for both turbopumps. So they're flipping the statement, saying the LOX has to be subcooled to get the right density, not the kerosene. According to Wikipedia (and corroborated by uhoh's diagrams), LOX at any temperature has a higher density than kerosene. So subcooling the LOX increases the density difference. But Spaceflight 101 may have a point. The engine has burns 2.8 kg of oxygen with 1 kg of kerosene. When you make the LOX denser, you bring the volumes of the two closer together, which might make pump design on a common shaft easier. Let's see if we can get a statement from source: this AIAA paper by Aerojet details the modifications done by them. 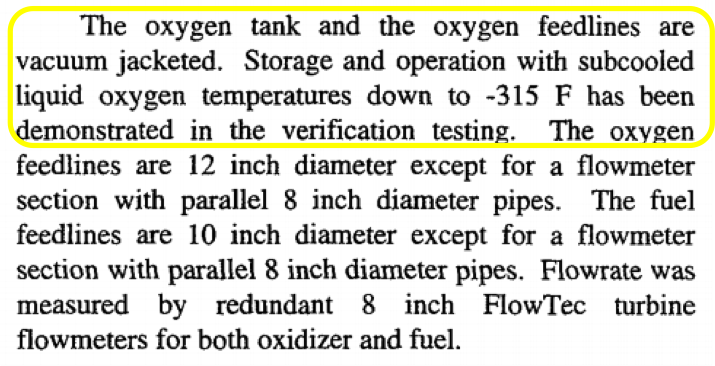 It mentions density only once (table 6 on page 16), and that same table lists fuel temperature as -30 °F (-34 °C), so it'd be nowhere near the same density as the LOX. Anyway, this paper confirms the kerosene does not have to be subcooled for the engine to work. They did tests running the engine with ambient-temperature RP1 and boiling-point LOX, as far as I can see they did burns of up to 140 seconds with this combination. 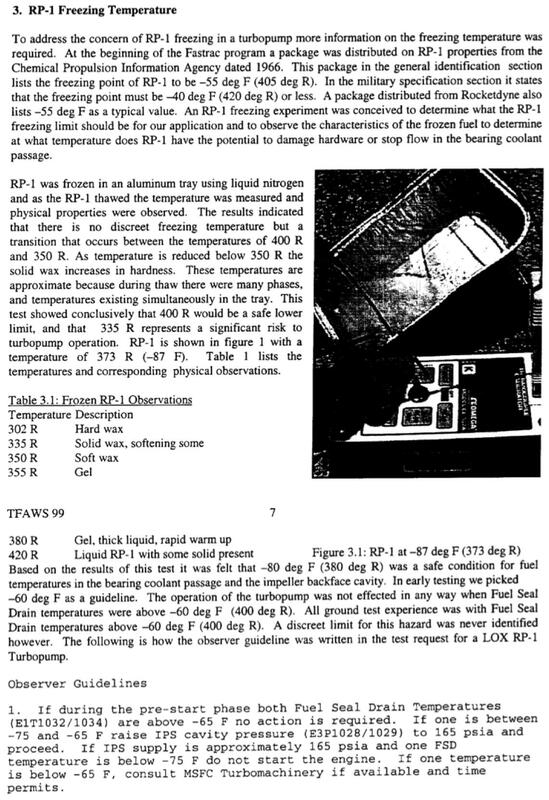 They did no tests with RP-1 subcooled below -37 °F (-38 °C). 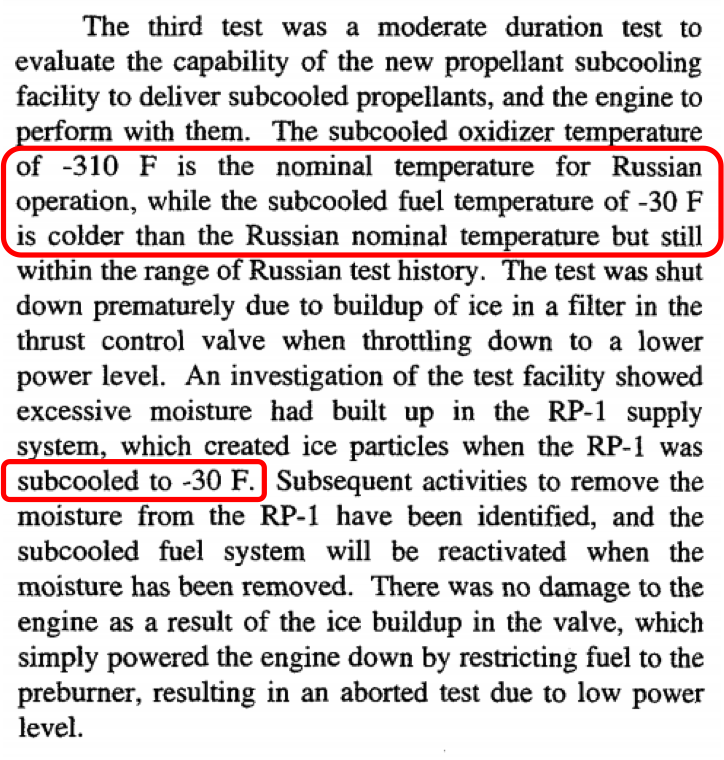 They also mention the Russians normally used kerosene at above -30 °F (-34 °C). 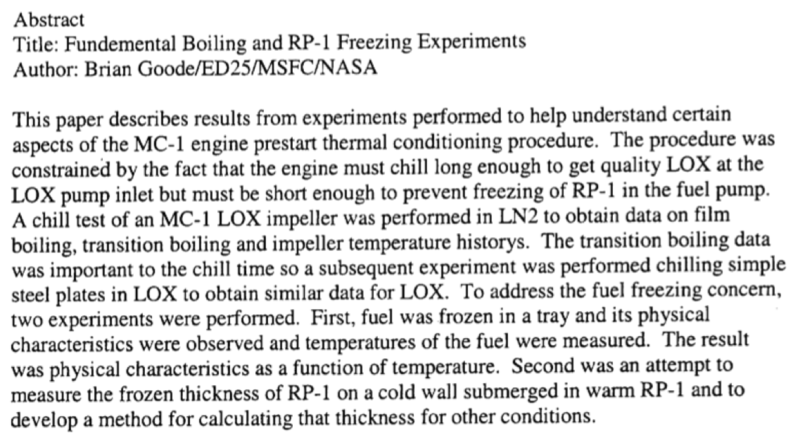 From this I conclude subcooling of either LOX or propellant is possible, but not necessary on this engine. So the question "Does the NK-33 engine require subcooled kerosene?" can be answered with 'No'. Single-shaft turbopumps are common in all sorts of rocket engines. hydrogen/LOX engines like the RD-0120, where the density of LOX and LH are much farther apart than the densities of LOX/RP-1. 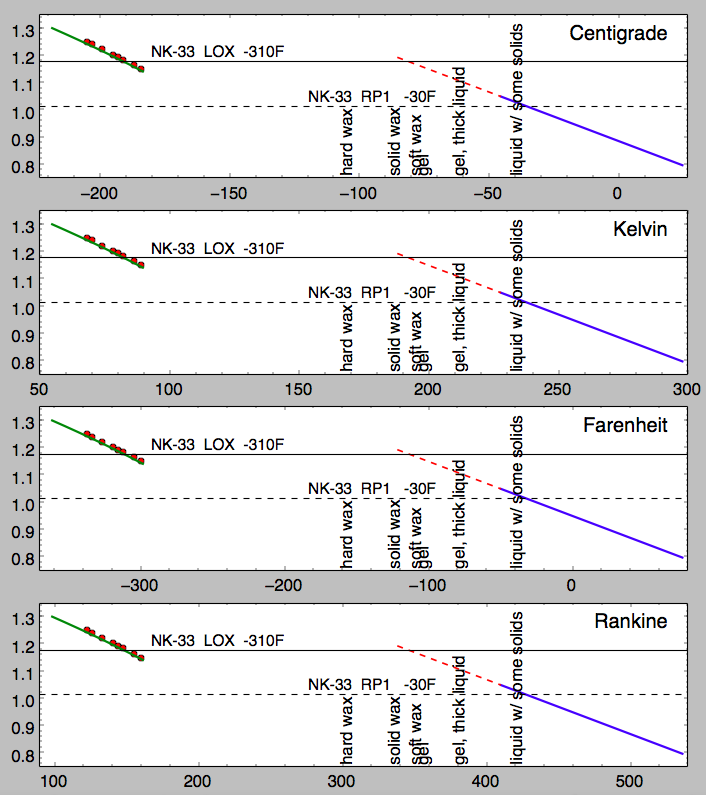 First, the only place I have been able to find the equal density claim is in the NK-33 Wikipedia article. (In fact it originates from the first version). There have never been provided any source for it. On the other hand, this paper seems to suggest that that is indeed the cases, although indirectly. The claim that the NK-33 needed similar densities in order to operate seems odd, as it is not the only closed-cycle engine, just one out of many with a great variety of propellants. The article does however mention a single rotating shaft, so the issue may be a ressult of centrifugal separation of the liquids. If the two propellants have similar densities (say within 40%) such as NTO & UDMH or LOX and kerosene, and the volume flow of oxidizer and fuel are similar, then the same type of impeller (running at the same speed) can be used on both of them on a single shaft. It goes on to say that with hydrogen/LOX you definitely want separate shafts. There seems to be a general relationship between impeller speed and propellant density where efficiency is optimal; hydrogen can be pumped on a higher-speed axial impeller while denser propellants want a slower radial or semi-radial impeller. Disclaimer: I am not a hydrodynamicist! So with a 2.6 LOX:kerosene mass ratio, this seems to say that, within limits, you'd actually want the kerosene less dense in order to achieve more equal volume flow. Not the answer you're looking for? Browse other questions tagged fuel engine-design cryogenics nk-33 sub-cooled or ask your own question. 3* Tonnes Unaccounted for in Falcon 9 FT Weight Wikipedia Calculation? Is the “cryogenic helium” system in recent discussions actually LHe for cryopumping? What temperature difference do the injectors in a cryo engine experience? How did the Space Shuttle keep its cryogenic fuel cold? How (actually) do sub-cooled propellants reduce cavitation within turbo pumps and make feed easier? Liquid Helium (4.2K) sealed, then raised to sub-LOX temperature (~70K) - what is the new pressure? Why would sub-cooled LOX tanks need to “topped-off” until the last minute or so? Does kerosene get ignited by a spark plug?